Note: If you are a student in Geog 1112, then it is very important for you to see the Prezi for this lab prior to doing the lab. If your instructor has not shown the Prezi, then remind him/her to access the Prezi here. In the previous labs you have examined solar radiation, the composition of the atmosphere, and the cycling of carbon through Earth’s spheres. The knowledge you gained in those labs is vitally useful for understanding the topic of this lab: global surface temperature. The global surface temperature is the temperature of the entire Earth as a whole, and understanding the controls of global surface temperature will be enable you to better tackle subsequent labs that focus on changes in Earth’s temperature from decades to hundreds of thousands of years. How does a change in the solar constant impact the absorption of shortwave radiation and the emission of longwave radiation by the Earth-atmosphere system? How does the ocean impact Earth’s energy balance? How does the concentration of greenhouse gases, besides water vapor, impact Earth’s surface temperature? Fact-based question →This will be a question with a rather clear-cut answer. That answer will be based on information (1) presented by your instructor, (2) found in background sections, or (3) determined by you from data, graphs, pictures, etc. There is more of an expectation of you providing a certain answer for a question of this type as compared to questions of the other types. Synthesis-based question → This will be a question that will require you to pull together ideas from different places in order to give a complete answer. There is still an expectation that your answer will match up to a certain response, but you should feel comfortable in expressing your understanding of how these different ideas fit together. Hypothesis-based question → This will be a question which will require you to stretch your mind little bit. A question like this will ask you to speculate about why something is the way it is, for instance. There is not one certain answer to a question of this type. This is a more open- ended question where we will be more interested in the ideas that you propose and the justification (‘I think this because . . .’) that you provide. Earth’s surface temperatures are affected by multiple factors, including solar radiation (i.e., solar constant), albedo, and the greenhouse effect. As you learned in previous lab exercises, the amount of solar radiation reaching the top of the atmosphere is known as the solar constant, and the amount of energy is expressed in Watts per square meter (W m-2). 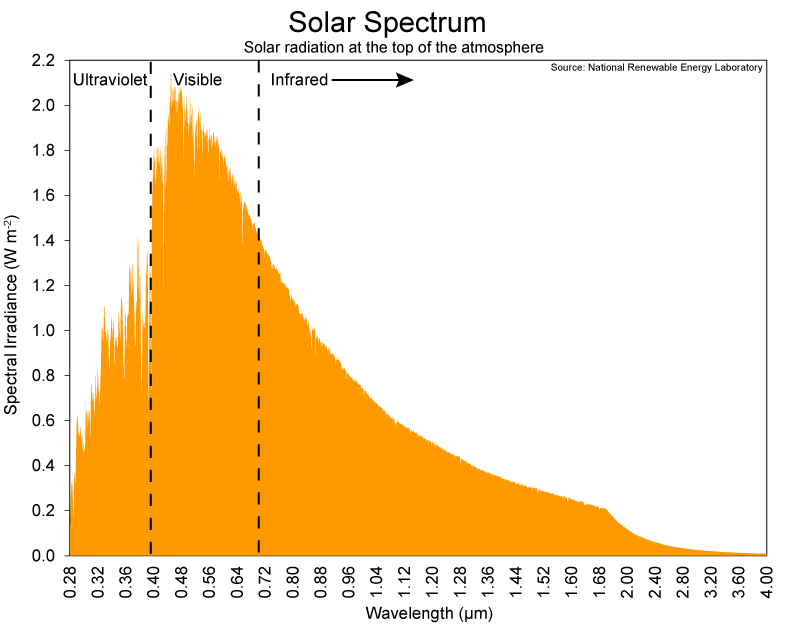 The amount of solar radiation reaching the top of Earth’s is approximately 1.74 x 1017 W, and this is mostly in the visible portion of the spectrum (see chart below). This value divided by the cross-sectional area of Earth yields the solar constant (approx. 1365 W m-2). However, since Earth is a sphere with an area of approximately 5.10 x 1014 m2 (the cross-sectional area of Earth is one-fourth this value), the average amount of incoming solar radiation at the top of the atmosphere is approximately 341 W m-2. 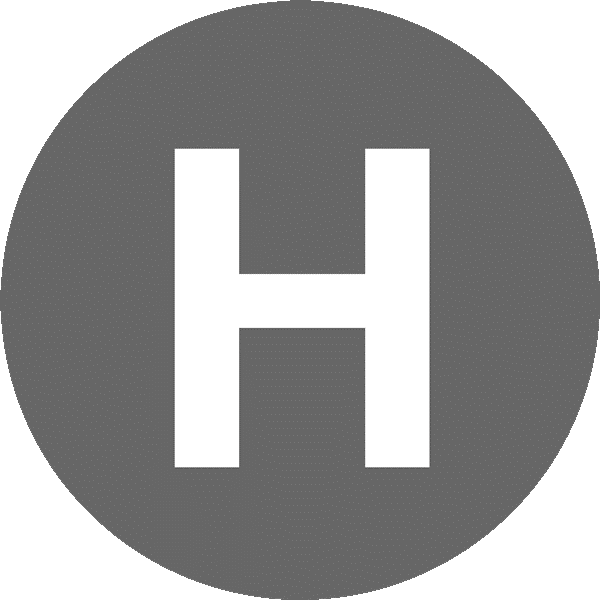 This value multiplied by four is the solar constant. Throughout this lab you will be seeing two numbers (1365 and 341) being used as the solar radiation at the top of the atmosphere. Just always keep in keep in mind that when the global surface temperature is calculated, the solar constant is divided by four (i.e., 1365 /4 = 341). The two factors that control the solar constant (i.e., the amount of solar radiation at the top of Earth’s atmosphere) are the Sun’s output and the distance between the Earth and the Sun. 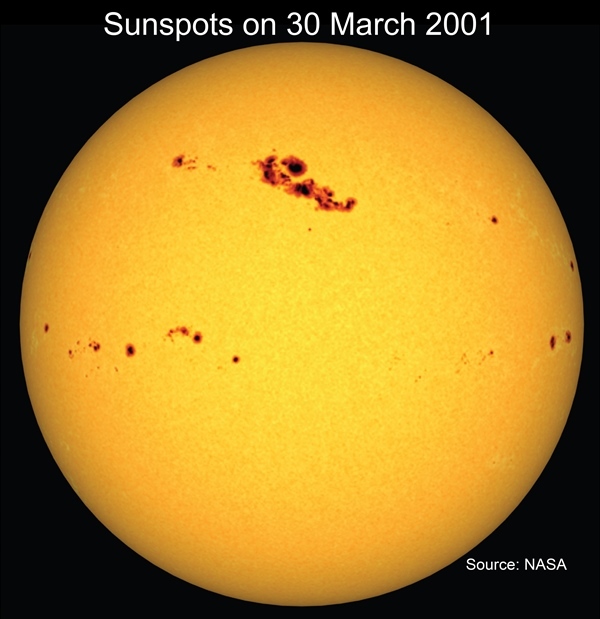 Solar output changes not only to the aging of the Sun over a very long time scale (i.e., the Sun’s luminescence increases by 10% every billion years) but also over a much shorter time scale due to the the occurrence of sunspots (see image below). 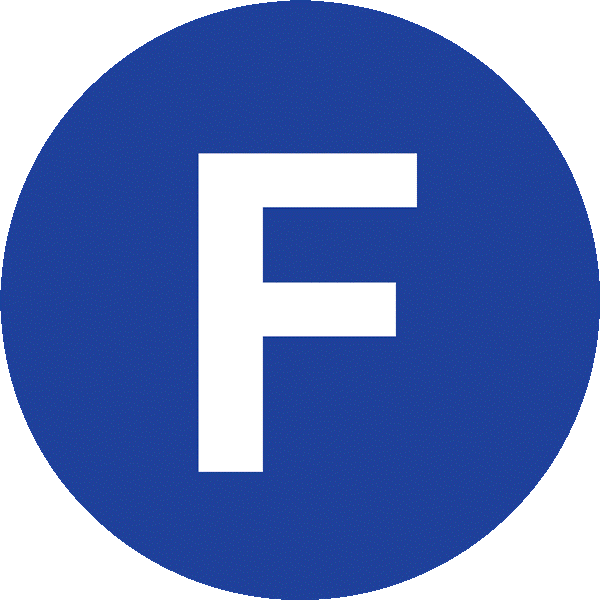 You learned in Lab 1 that over the course of a year the Sun’s distance from Earth can vary by 5 million kilometers, with Earth being closest to the Sun on January 4 (perihelion) and farthest from the Sun on July 4 (aphelion). But the distance from the Earth to the Sun from year to year hardly changes; therefore, year-to-year changes in the solar constant are not caused by changes in the Earth-Sun distance. 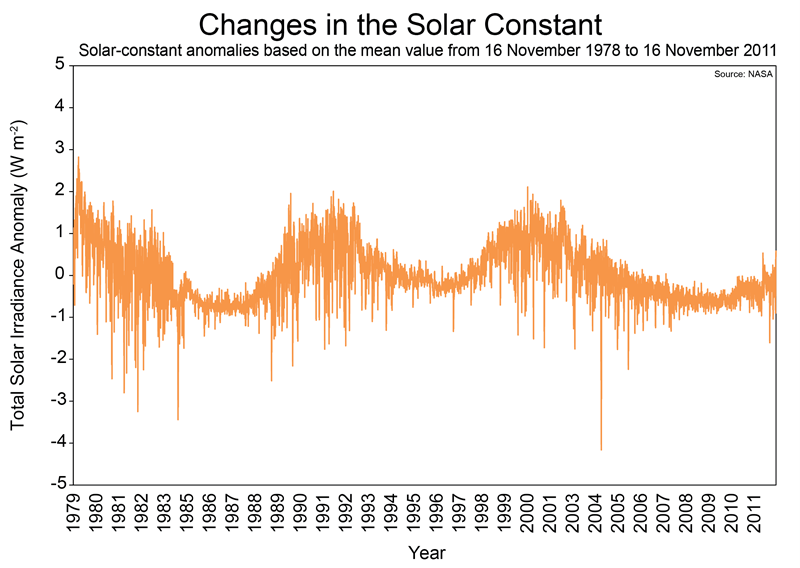 Year-to-year changes in the solar constant are caused by changes in the numbers of sunspots from year to year, with on average an 11-year period between peaks in sunspot numbers (see figure below). The number of sunspots also has undergone substantial changes from decade to to decade and from century to century. 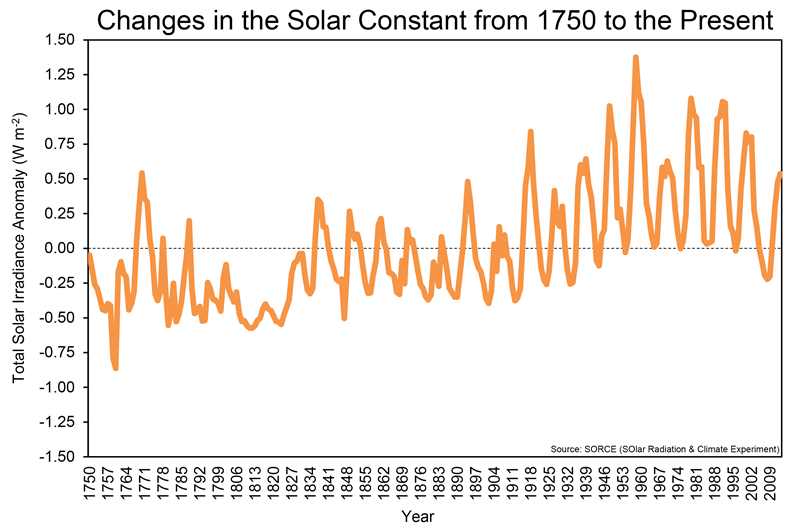 For example, the figure below shows an increasing trend in the solar constant — due to increasing numbers of sunspots — from the late 18th Century to the late 20th century. Q1: What things appear on the Sun to increase solar output and cause the solar constant to not be constant? You just learned that the amount of solar radiation reaching the top of Earth’s atmosphere (i.e., the solar constant) is constantly changing, and that the solar constant is typically around 1365 W m-2. The amount of solar radiation that eventually is absorbed by Earth’s surface also is constantly changing. This is due to not only to changes in the atmospheric absorption of solar radiation (e.g., stratospheric ozone) but also to changes in the albedo of the atmosphere and Earth’s surface. Albedo is the ratio of the light reflected by a body to the light received by it; albedo values for Earth’s surface features range from 0.05 (water) to 0.85 (snow and ice). The image below shows typical albedo values for surface features and clouds. Q2: What objects/surfaces have the highest albedos? Q3: What surfaces have the lowest albedos? Watch the video below to learn more about albedo. Q4: What type of feedback mechanism involves the melting of sea ice which then results in more absorption of solar radiation than the ice did and thus results in the further melting of ice? Hint: Watch the video. The greenhouse effect involves the absorption and emission of thermal infrared radiation by greenhouse gases (e.g., water vapor, carbon dioxide, methane, some ozone-depleting substances, etc.) in the atmosphere; some of the emitted radiation is absorbed by the Earth’s surface and, in turn, increases surface temperatures. Click Greenhouse_Effect to view an animation of the greenhouse effect. As you learned in the Troposphere lab, the most prevalent greenhouse gas is water vapor (H2O), and the second-most prevalent greenhouse gas is carbon dioxide (CO2). Without greenhouse gases, the global surface temperature would be below freezing. Therefore, greenhouse gases make Earth a habitable planet. Most greenhouse gases have been increasing since the Industrial Revolution (ca. 1750) and prior to that time. 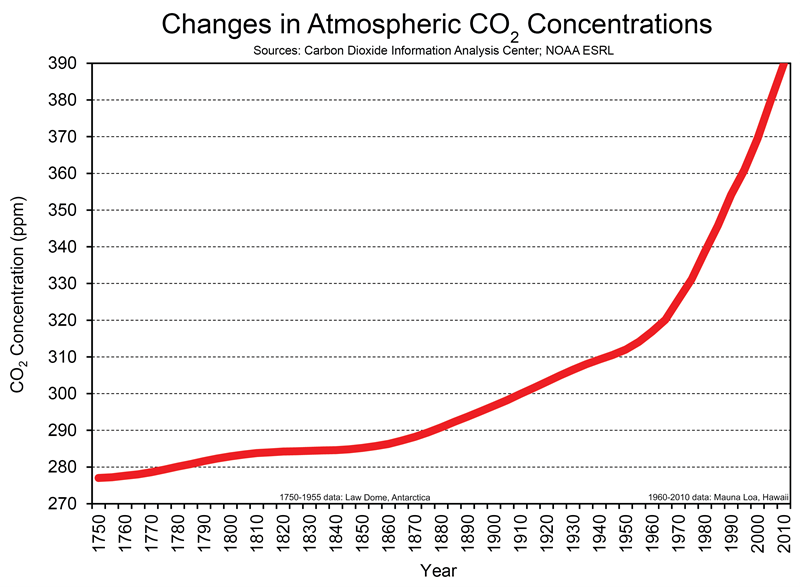 Below is a chart showing CO2 concentrations since 1750. And scientists try to get a handle on the effects of increase in greenhouse gases on Earth’s temperature by calculating values known as radiative forcings. A radiative forcing takes into account the increase in the concentration of a greenhouse gas and the radiative efficiency of the gas (i.e., how well it absorbs longwave radiation). For example, methane (CH4) has a much higher radiative efficiency than CO2, but its increase in concentration since the Industrial Revolution has been trivial compared to the increase in CO2 concentrations. A radiative forcing for water vapor, the most prevalent greenhouse gas, is not available, because a change in water-vapor concentration is considered a feedback and not a forcing. Q5: What type of radiation is absorbed and emitted by gases as part of the greenhouse effect? 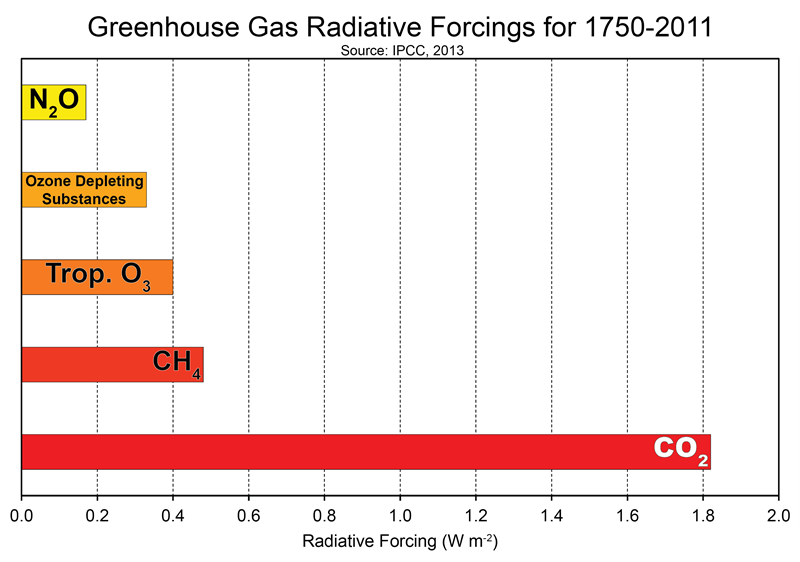 Q6: Which greenhouse gas had the largest radiative forcing from 1750 to 2011? The Fifth Assessment Report by the Intergovernmental Panel on Climate Change provides the following estimates of radiative forcing from 1750-2010: greenhouse gases = +3.30 W m-2; solar radiation = +0.05 W m-2; and surface albedo = -0.15 W m-2. Therefore, an increase in greenhouse gases has caused a much larger increase in energy than has the increase in the solar constant. In this part if the lab you are going to explore Earth’s annual energy balance. Click Energy_Balance to open a Prezi of Earth’s energy balance for a typical year based on data from 2000-2004. The different types of energy involved in the energy balance are solar radiation, longwave radiation, sensible heat, and latent heat. Make the Prezi full screen and advance through the slides and answer the questions below as you are doing so. Q7: What is the source of the 341 W m-2 of radiation that is entering the Earth-atmosphere system? Q8: What gas is responsible for much of the 78 W m-2 that is absorbed by the atmosphere? Q9: Approximately what percent of the incoming solar radiation at the top of Earth’s atmosphere that reaches Earth’s surface is absorbed by Earth’s surface and what surface is responsible for most of the absorption? Q10: What percent of the incoming solar radiation is reflected/scattered to space by the atmosphere and the Earth’s surface combined? Q11: What gases cause the “back radiation” and what type of radiation is it? Now that you have a handle on the impacts of albedo and the greenhouse effect on the energy balance, you will explore the impacts of changes in albedo and the greenhouse effect on the global surface temperature. Click Temperature_Model to open a Microsoft Excel file. NASA’s Global Energy Equilibirum Interactibe Tinker Toy (GEEBIT) is the foundation of the temperature model you will be using. You will first land on a worksheet labeled “1. Black Body.” In this scenario, Earth is treated as a blackbody without an atmosphere. A black body is a hypothetical object that absorbs all incoming radiation; thus, it has no albedo. The figure below shows how the black-body temperature is calculated. Since the albedo is zero for a black body, the temperature is simply a function of the incoming solar radiation. 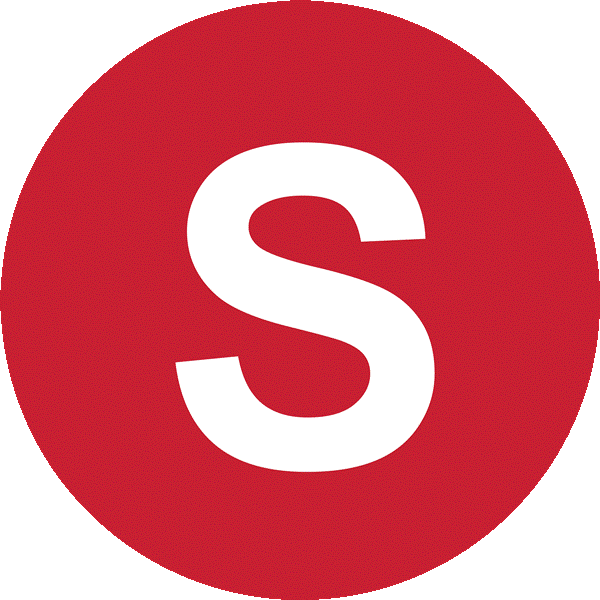 The Stefan–Boltzmann constant is denoted by the Greek letter sigma (σ). Q12: What is the solar constant for Earth that is used throughout this exercise? Please provide the units. Q13: What is Earth’s albedo when Earth is portrayed as a black body without an atmosphere? Q14: What is the only control of Earth’s surface temperature when Earth is portrayed as a black body without an atmosphere? Earth is not a black body, so move to the second worksheet (2. Surface Albedo) to calculate Earth’s surface albedo. You need to calculate this albedo value so that a revised global surface temperature can be calculated. We are assuming that 184 units of solar radiation reaches Earth’s surface and that the present-day configuration of land covers reflects some of that radiation back into space. If the Earth were a black body then Earth’s surface albedo would be zero. If Earth were completely covered by ice and snow, then Earth’s surface albedo would be approximately 0.85. The same equation as was used for black-body earth is used to calculate the temperature of Earth with surface features but without an atmosphere. 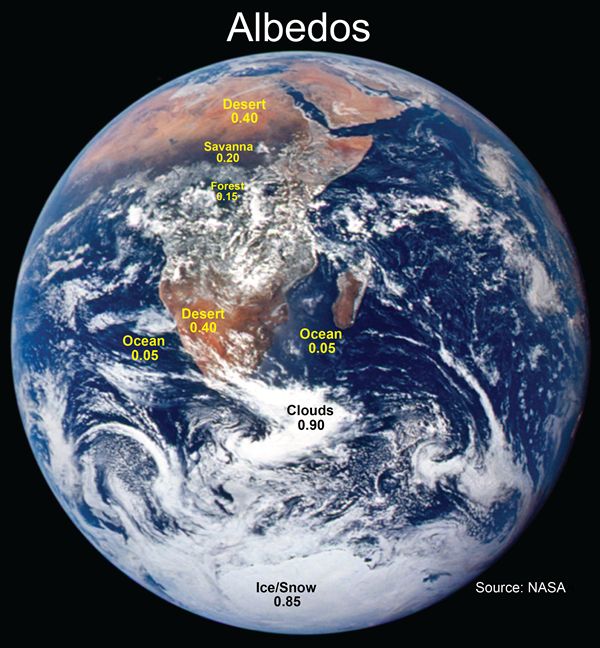 Q15: What is the actual albedo of Earth’s surface? Q16: How do you think adding a surface albedo to Earth will affect the global surface temperature (i.e., how will the temperature change when going from a black body to Earth with surface features)? Move to the third worksheet (3. Surface Features) to see the effect that your calculated albedo value for Earth’s surface has on the global surface temperature. Remember that the black body Earth absorbed all incoming radiation. Q17: How and why did Earth’s surface temperature change when going from being a black body to being a planet with surface features (e.g., water, forest, deserts, and snow & ice)? Q18: Why is it impossible to have surface features, such as water, forests, and snow & ice, and not have an atmosphere? Think of the hydrologic cycle (Lab 3) and the carbon cycle (Lab 4). We still haven’t reached reality. Earth has an atmosphere and one thing the atmosphere does is reflect solar radiation. Therefore, go to the fourth worksheet (4. Total Albedo) to calculate Earth’s albedo based on both surface reflectance and atmospheric reflectance. Q19: What is Earth’s albedo (i.e., what proportion of the incoming solar radiation is reflected by Earth’s atmosphere and surface)? Q20: Taking into account both the change in albedo and the addition of the greenhouse effect, what effect do you think adding an atmosphere to Earth will have on its surface temperature? Move to the fifth worksheet (5. Current Earth) where you will see how combining solar radiation, albedo, and the greenhouse effect will yield the best estimate of the present-day global surface temperature. Notice the difference in the equation (“How Temperature is Calculated”) between Current Earth and Earth with just surface features (3. Surface Features). The new equation includes the greenhouse effect. Don’t forget to add in a CO2 concentration in the fifth worksheet (5. Current Earth) in order for the greenhouse effect to be estimated. The greenhouse effect in this simple model is calculated using just the CO2 concentration, whereas many gases are involved in the real-life greenhouse effect. Q21: Even with a large increase in albedo, why is current Earth nearly 20° C warmer than Earth with only surface features? The sixth, seventh, eight worksheets expose you to the Last Glacial Maximum (LGM). The LGM occurred approximately 20,000 years ago, and was characterized by a far southward expansion of ice sheets in the Northern Hemisphere. You will explore why the LGM occurred in the next lab (Glacial-Interglacial Cycles). Go to the sixth worksheet (6. LGM Albedo) to calculate Earth’s albedo during the Last Glacial Maximum. 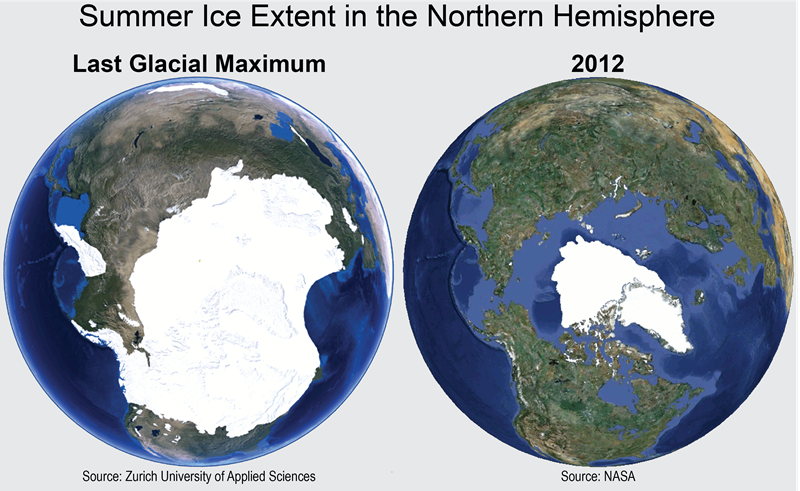 Notice how the surface areas of water, forest, desert, and snow/ice differed between the current situation and the Last Glacial Maximum. We are assuming the atmospheric albedo during the Last Glacial Maximum was the same as the current atmospheric albedo; however, the difference in surface features should have caused the surface albedo during the Last Glacial Maximum to be different than the current surface albedo. Don’t forget to put your estimates of albedo values in each of the four cells. Q22: How did land cover during the Last Glacial Maximum differ from the current land cover? Q23: What was your estimate of Earth’s albedo during the Last Glacial Maximum? Why should it be larger than the Earth’s current albedo of 0.30? Q24: How much cooler do you think Earth was during the Last Glacial Maximum compared to the current temperature? Go to the seventh worksheet (7. Carbon Dioxide) to find the CO2 concentration during the Last Glacial Maximum. These concentrations were determined from air bubbles trapped in ice cores from Antarctica. The CO2 concentration is used again to calculate the greenhouse effect. We are assuming a linear relationship between CO2 concentration and the strength of the greenhouse effect, and by extension a linear relationship between CO2 concentration and temperature. Q25: How much colder was Earth’s surface temperature during the Last Glacial Maximum compared to the current temperature? Q26: Why did the lower temperatures result in lower atmospheric CO2 concentrations? Think back to Lab 4 about the carbon cycle and what component of the cycle was taking in more CO2 during the Last Glacial Maximum. Q27: What impact did a lower CO2 concentration have on the greenhouse effect and ultimately Earth’s surface temperature? Let’s now see what the global surface temperature might be in the year 2050. You are assuming the solar constant and Earth’s albedo will not change. But one thing that should change is the concentration of greenhouse gases. Go to the seventh worksheet (7. Carbon Dioxide) to find the projected CO2 concentration for 2050. Q28: What is the projected atmospheric CO2 concentration in 2050 and why are CO2 concentrations projected to increase? Q29: What do you expect the global surface temperature to be in 2050 and how much different will it be from the current temperature? Go to the ninth worksheet (9. 2050) and plug in the CO2 concentration that you found for the year 2050. The CO2 concentration is used once again to calculate the greenhouse effect. Notice that the albedo value you calculated in the fourth worksheet and used for “Current Earth” is located under “Earth’s Albedo.” The albedo should be 0.30. Q30: How much global warming is expected between now and 2050 and what is the major factor behind the warming? Q31: List two assumptions you made when modeling Earth’s surface temperature? Before the next lab, write for yourself a one-sentence response to each of the following big questions of this lab.